There is an afternoon storm coming in over Atlantic Beach on the Florida coast. The air is humid and warm, the sand soft and grey; the ocean is slightly cold but still refreshing. Not too far away, surfers catch the waves that moment’s later dance around my feet and then pull back out to sea like God is breathing in and out in the water. It’s amazing to sit right here where the waves come and go at the same time, washing back and forth. 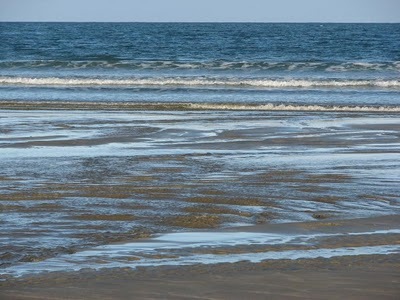 The sand falls out from under your feet as the tide pulls, and then covers them again as it pushes another wave ashore. Buried just under the sand are little sand crabs, struggling to stay in place. A crowd of dolphins is following a fishing boat just off the shore. They look like they’re having a great time. I’m sitting in a place that is so permanent, so temporary. It’s that place where the sand meets the sea; there are no foot prints here, nor can there be. My presence will leave no impression; its impression will never leave me. The ocean is in a constant state of coming and going. The moment I move, all trace of my sitting here will vanish with the tide even though I’ve been here for quite awhile. It’s the first time that I’ve ever seen anything that resembled time in physical motion. Nothing stops the tide from reforming sand; much like time molds itself around our temporary existence, and then simply marches on without any kind of lasting change. It is change without our input. Life is so much bigger than we all imagine if only we open our eyes to take it all in. I love seeing life through my daughter’s eyes…her view is so full of wonder. Our “condo” for the week is just off the beach, a beautiful , 4 bed 2 bath, two story house with more than enough room for the six of us. I’m here with my BFF Donna, her husband and son; my husband Brian and our daughter Taryn. It is peaceful on this red brick street. There is the constant, lulling sound of the waves. The sky is crystal blue, the sun warm, the air heavy with moisture from the coming rain. Date palm trees line the streets, so different from the ancient walnut and oak trees that I live with in Indiana. Exotic flowers surround the lush green grass; sea oats protect the sand dunes. The sand itself is powder fine and soft against your skin, the water super salty and clear. Last night we arrived late and had time to walk the beach at sundown. 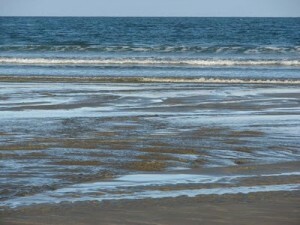 Of course, the call of the waves taunted me into the surf with my little nephew. My favorite sundress and I emerged totally soaked, laughing. It’s been a long time since I felt peace in my soul…the ocean shore feels so peaceful to me. I wish that I could capture that and send it north. I watched the early morning mist burn off the sea as the sun rose, and the stream of people venture out to claim their place in the sand. Some were totally organized with pavilion type tents that provided shade for a table and their chairs. Some were hauling wagons of beach toys, children in tow. The wading pools were full of toddlers as the surf went out. Gradually, they disappeared as the shoreline kept back into the sea. Seagulls swooped from the sky, lifeguards rolled out their stands, and surfers caught waves. I watched the people walk by and the ocean erase their footsteps, fascinated. Fish jumped, shells washed to the shore, a man and his son found a live starfish and returned it to the ocean after sharing its wonder with Taryn. Life is this brief, beautiful dance. It’s a journey of self discovery that you get to share with others, the push and pull of your own waves on the shore. I was thinking to myself of this time last year, how different the world appeared to me; I didn’t know that it would virtually all change. There are so many things that I wish that I had said to the people that have gone to live their separate lives, good things, thoughtful things, encouraging things. There are questions I wish that I had asked, care I didn’t express as fully as I felt it. There are moments in that year that I treasure like the shells that wash unexpectedly to the shore, delicate and beautiful. Still, the shells at my feet are only half of the whole, their purpose exhausted. I remember those moments though a dark looking glass that has only one version and no depth. Life is funny that way. Like the tide, life has gone out leaving living memories to examine, just to have the water rush back in and fill me with the hope and expectation of a new day. Hope rises up in a place like this, one that is so different from the life that you lead every day. Here, my big choice is what fun thing to do or a sojourn lying in the sun on the pristine beach, a ride on the waves with my questionable surfing skills, a walk on the sand with my husband. My greatest contemplation is when to eat lunch. Home is different…there are decisions to be made, graduate school to complete…and a whole new world of people and information to investigate. Three years from now, I will be Dr. Alison Rodgers – wow. I thought that it would be intimidating to change so much of my world at one time, to leave behind my seminary family and school, to recognize that my calling isn’t going to be that classic “ministry” setting, but where I belong in the muck and the mire of real life with people in pain. I thought that I’d be reluctant in forging ahead to a new place, but I find that I am not. Perhaps that is what I wanted to send northward all along.